As of March 5, 2015 my portfolio stands as the following. The portfolio sits really close to my first large goal of $100k. That will be my first large milestone in the journey to $1m. I used to make fun of the dividends I receive every month, but at this amount the dividends are starting to make a noticeable difference. After $100k, my portfolio can start doing work on its own. An 8% capital gain on $100k is $8,000. A 3% dividend yield on $100k is $3,000 a year or 250 a month. A 10% increase in dividends on a $100k portfolio @ 3% yield will be a $300 raise. 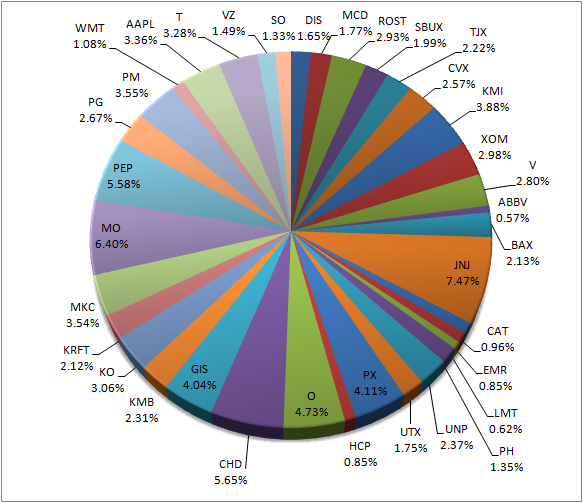 The portfolio is currently around 22% higher than the goal I set last year. I have been able to contribute more than I had planned last year. As shown in my portfolio, my focus is on buying high quality at a fair or discounted value. Stocks in green are core, yellow is supporting, and red is speculative. The ratio is currently 59/15/16/10 core/support/spec/cash. Nearly all of my holdings are above investment grade (BBB+ credit rating). My goal is to maintain a 3% yield by mixing higher yielding slow growth stocks with fast growing low yielding stocks. The sector distribution is now more towards my liking. 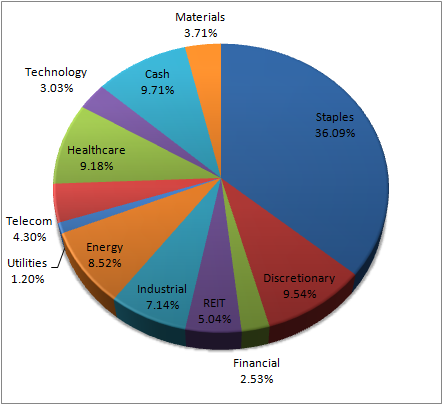 The sector that is still severely underweighted is utilities and REITs. A time will come when interest rates are raised and these stocks are undervalued. For the time being, many of the companies I want in these sectors are severely overpriced (AVA, PNY, XEL, WEC, D, DUK) (O, HCP, HCN, DLR, NNN, UHT, VTR). My emphasis is on over-weighting the Staples sector. My cash holdings is currently high since I cannot distribute cash fast enough since I cannot find obvious deals. I have not been completely happy with my recent buys since my purchases were all at fair value or slightly above fair value. The stock market is currently experiencing PE expansion and that unsettles me. I rather see a dropping stock market than an increasing one. The consumer discretionary sector has been performing very well lately in my portfolio. ROST and AAPL are my best performers so far. 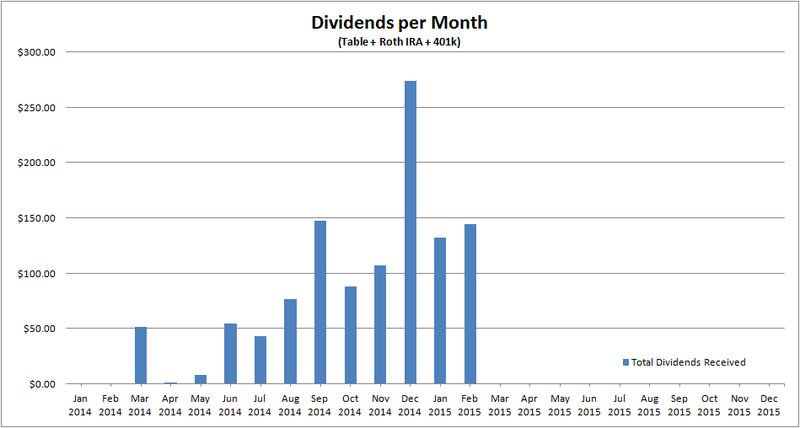 The dividends received last month is a large increase compared to my start last year in March 2014. I believe I can crack the $200 barrier in the coming months. All of my stocks are reinvested into the company that payed the dividends. The forward dividends are actually much higher than what has been received. This is because the shares I have bought recently do not register until the next ex-dividend date.